نهمین دوره انتخابات ریاست‌جمهوری در ایران نقطه عطفی در نقش رسانه تلویزیون در تبلیغات انتخاباتی بود. به نظر می‌رسد مصاحبه‌ها و فیلم‌های تبلیغاتی نامزدهای انتخابات و مناظره‌های تلویزیونی میان چهره‌های سیاسی طرفدار آنها نقش بسیار مهمی در چگونگی برداشت بینندگان از هریک از نامزدها داشت و در نهایت بر چگونگی رأی‌ دادن آنها تأثیرگذار بود. در این مقاله با بهره‌گیری از داده‌های چند پژوهش، ازجمله یافته‌های به‌دست آمده از مصاحبه‌های کیفی که از سوی نویسنده در ماه‌های پس از پیروزی آقای احمدی‌نژاد با مردم صورت گرفت، نقش سیمای جمهوری اسلامی در شکل‌گیری رفتار رأی‌دهی مردم مورد ارزیابی و تحلیل قرار گرفته است.نتایج به‌دست آمده نشان می‌دهد که تلویزیون، دست‌کم در انتخابات ریاست‌جمهوری نهم، اصلی‌ترین منبع کسب اطلاعات مردم درباره نامزدهای انتخابات بوده است. The 9th presidential election in Iran was a turning point in the role of television in electoral campaigns. It seems that talk shows, the candidates’ campaign videos, and TV debates among political figures advocating the candidates had a key role in the viewers’ opinions towards the candidates, and in their final decision. 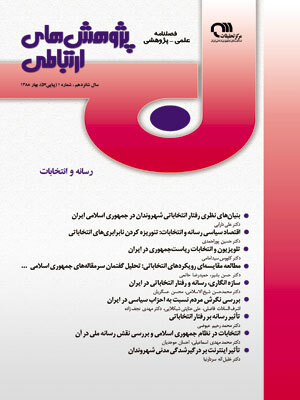 Employing the results of a number of studies including the qualitative interviews with people by the author in the months following the victory of president Ahmadinejad, the present article discusses the role of IRIB in the individuals’ final vote. The research finding show thal television, at least in the 9th presidential election, was important reference of people for knowing candidates. ترابی، مهناز. (1377). نظرخواهی از مردم تهران درباره اخبار سیما. (در بین نوجوانان 13 تا 17 ساله و 18 ساله به بالا). تهران: امور سنجش برنامه‌ای صدا‌و‌سیما. ‌سازمان ملی جوانان، دفتر مطالعات و تحقیقات. (1384ـ ب). نحوه استفاده دانشجویان از رسانه‌های جمعی برای دریافت اخبار سیاسی. مجری کاووس سیدامامی تهران: پدیدآورنده. سازمان ملی جوانان، دفتر مطالعات و تحقیقات. (1384ـ الف). سنجش اشکال و سطوح مشارکت سیاسی دانشجویان و نگرش‌های آنان درباره مشارکتسیاسی. مجری کاووس سیدامامی و عبدالمطلب عبدالله. تهران: پدیدآورنده. ‌سازمان ملی جوانان، دفتر مطالعات و تحقیقات. (1385). ارزش‌ها، نگرش‌ها و رفتار سیاسیجوانان. تهران: پدیدآورنده. Ardal, Bernt & Pieter van Wijnen. (2005). The European Voter. Oxford: Scholarship Online Monographs, 192-213. Arts, Kees & holli A. Semetko. (2003). The Divided Electorate: Media use and Political Involvement. The journal of Politics, 65 (3), 759-784. Aime, David abd William L. Benoit. (2005). Political TV Advertising in Campaign 2000, Communication Quarterly, 53 (4), 473-493. Benoit, William L. (2001). The Functional Approach to Presidential Television Spots: Acclaiming, Attacking, Defending (1952-2000). Communication Studies, 52 (2), 108-127. Benoit, William L. & John P. McHale. (2003). Presidential Candidates’ Television Spots and Personal Qualities. The Southern Communication Journal, 68 (4), 319. Brooks, Jean. (2007). The Great Exaggeration: Why Primetime TV is Alive and Well, Politically Speaking. Campaigns and Elections, 28 (8), 70-72. Coleman, Retina & Stephen Banning. (2006). Network TV News’ Affective Framing of the Presidential Candidates: Evidence for a Second-level Agenda-Setting Effect Through Visual Framing. Journalism and Mass CommunicationQuarterly, 83 (2), 313-328. Entman, Robert M. (1989). How the Media Affect What People Think: An information Processing Approach. The journal of Politics, 5 (2), 347-370. Jerit, Jennifer, Jason; Barajas; Toby, Bolden. (2006).Citizens, Knowledge, and the Information Environment. American journal of Political Science, 50 (2), 266-282. Joslyn, Mark R. & Steve Cecoli. (1996). Attentiveness to Television News and Opinion Change in the Fall 1992 Presidential Campaign. Political Behavior, 18 (2), 141-170. Kaplan, Noah, David K. Park, & Travis N. Rid out. (2006).Dialogue in American Political Campaigns? An Examination of Issue Convergence in Candidate Television Advertising. American journal of Political Science, 50 (3), 724-736. Lazarsfeld, Paul, Bernard Burleson Hazel Goaded, (1944). The People’s Choice. New York: Columbia University Press. Lee, Chelan & William L. Benoit. (2004). A Functional Analysis of Presidential Television Spots: A Comparison fo Korean and American Ads. Communication Quarterly, 52 (1), 68-80. Martin, L. John. (1976). Recent Theory on Mass Media Potential in Political Campaigns. The Annals of the American Academy of political Science, 427 125-133. McCombs, M.E. & Shaw, D.I. (1972). The Agenda Setting Function of Mass Media. Public Opinion Quarterly, 36 (2), 176-187. Weaver, D. (1996). What Voters Learn from Media. Annals of the American Academy of Political and Social Science, 546, 34-47. Westen, D. (2007). The Role of Emotion in Deciding the Fate of the Nation. New York: Public Affairs.